How do you respond to being degraded or maligned? While her husband Nelson Mandela was jailed for 27 years, Winnie Mandela did not shy away from the liberation struggle in South Africa. Despite personal attacks and her own jail time, she continued fighting with even more tenacity against the white-minority rule. Her commitment and fortitude helped her become an international anti-apartheid symbol and inspired generations of activists to believe in themselves and use their voices. To break the chains of oppression, first free yourself from inferiority. Sometimes others may try to humiliate you due their own bias or strip away your dignity for their own gain. Don’t accept or internalize their insults. Fight for your right to live free and express your gifts. Be a champion for justice and equality for yourself and others. 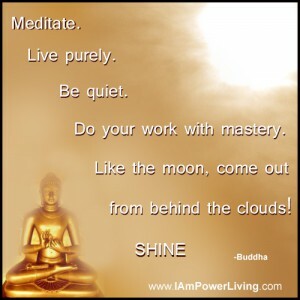 Most of all, affirm your innate greatness every day. 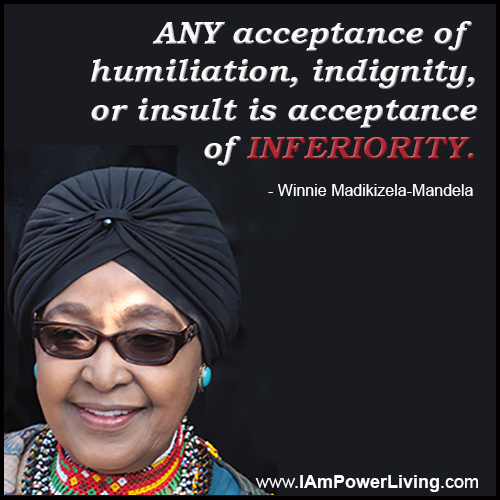 Have the courage to step out on faith and become a “voice of defiance” as Winnie Mandela was described. If you know you are standing in Truth, stand your ground. See more quote cards in the African Diaspora Quote Card Gallery, and the Nelson Mandela Quote Card Gallery. Also read 10 Qualities of Greatness Inspired by Nelson Mandela and Nelson Mandela’s Lesson on Love.